A native of Wellsboro, Pennsylvania, bass-baritone Marc Callahan (Assistant Professor) received his Bachelor of Music degree from Oberlin College where he studied with the renowned pedagogue Richard Miller. He holds a Master of Music degree from the Cincinnati College Conservatory of Music and a Doctor of Musical Arts in vocal performance and opera direction from the same institution. Dr. Callahan was also the recipient of the Rotary Scholarship from the Cincinnati Chapter, which allowed him to travel to France, where he earned a Diplôme Supérieur d’Exécution de Chant from the École Normale de Musique de Paris and a Diplôme d’Artiste Lyrique from the Schola Cantorum. He studied French at the Institut de Touraine and French art song with mentor François Le Roux at the Académie Françis Poulenc. He was winner of the Prix Lili Boulanger at the Concours International d’Interprétation de la Mélodie Française and has sung a duo recital of French song alongside the legendary soprano June Anderson and pianists Noël Lee and Jeff Cohen. While at university, he apprenticed with the Central City Opera (where he was awarded the Studio Artist Award), Des Moines Metro Opera, Sarasota Opera, Santa Fe Opera, Britten-Pears Academy and the Centre National d’Insertion Professionelle des Artistes Lyriques. Dr. Callahan’s performance career has taken him around the world, singing at opera houses such as: The Royal Opera House, Santa Fe Opera, Théâtre des Champs Elysées, Théâtre du Capitole, Opéra National de Lyon, Opéra de Montpellier, Opéra Comique, Théâtre Royale de Versailles, Opéra de Marseille, Central City Opera, Dayton Opera, the Ohio Light Opera and Opera North (UK), among others. His repertoire includes: Don Giovanni, Figaro (Le nozze di Figaro), Papageno (Die Zauberflöte), Guglielmo (Cosi fan tutte), il Conte di Almaviva (Le Nozze di Figaro), Belcore (L’Elisir d’amore), Count Arnheim (The Bohemian Girl), Zar Peter (Zar und Zimmerman), Mercutio (Roméo et Juliette), Ramiro (L’Heure Espagnole), Harlekin (Ariadne auf Naxos), Sid (Albert Herring), Morales (Carmen), Pish-Tush (The Mikado), Samuel (Pirates of Penzance), Frédéric (Lakmé), Escamillo (Carmen), Passagallo (Opera Seria), Le Carnival (Le Carnival et la Folie), Artemidore (Armide), Bobinet (La Vie Parisienne), and Starveling (A Midsummer Night’s Dream). As a concert performer, he has sung Charpentier’s Leçons et Ténèbres with Les Arts Florissants, an evening of mélodie française with the London Song Festival, Haydn’s The Creation, Götterdämmerung with Midsummer Opera (London), a program of Henri Dutilleux mélodies (Radio France), Stravinsky’s Les Noces, Philip Glass’s Symphony No. 5, and as bass soloist in The Tempest with Les Ombres and the Opéra de Marseille. Opera magazine has reviewed him as “a powerful baritone, providing wickedly glamorous tone.” He has recorded with Virgin Classics, FRA Productions, Passavant, Radio France, and Newport Classics. 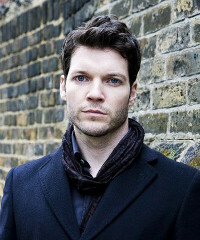 As an opera director, Dr. Callahan has received critical acclaim for his production of Jean-Philippe Rameau’s Les Indes Galantes, saying it was “designed and directed with jaw-dropping invention.” He has also assisted on Martin Duncan’s productions at the Royal Opera House, the Aldeburgh Festival and the Holland Festival (The Cure/The Corridor), acted as collaborateur artistique on Les Fiançailles au Couvent at the Théâtre du Capitole, provided research for Thomas de Mallet Burgess’s La Vestale for the Wexford Festival and observed Bijan Sheibani on The Virtue of Things for the Royal Opera House. Recent productions include Mozart’s The Marriage of Figaro and Louis Aubert’s The Blue Forest (National Opera Association Prize Winner 2017) for Oregon State University’s opera program, where he was a Visiting Professor in Opera and Voice.